Welcome. This year marks the 14th. anniversary of my two Grissim guides, which I'm gratified to report continue to be well received. Here you will find a fair amount of useful information, including some that many manufacturers would prefer you not know. The goal is not just to sell books but to assist you with your research and to help you be informed, empowered, and confident as you make the many decisions involved in the purchase of your new home. Note: As a journalist for more than three decades, maintaining my credibility is important. Accordingly, other than income derived from the sale of my books, I neither solicit nor accept a dime (nor gifts or freebies) from the industry about which I write. My readers have my assurance I intend to keep it that way. Thanks for visiting. And best of luck with your home buying research. 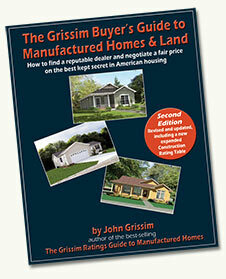 To ensure the lowest cost for the print editions of The Grissim Buyer's Guide to Manufactured Homes and The Grissim Ratings Guide to Manufactured Homes, both books are now sold exclusively on Amazon.com. Simply click on the Buy Now button to be taken directly to the book's listing on Amazon.com. As for the digital editions of the two guides, they continue to be sold exclusively on this site, either separately (for $18.95) or as a two-book special for $31.95. The essential buyer's resource, listing every builder in the U.S., their histories, products, price ranges, construction ratings, need-to-know information and much more. Completely revised, updated, and redesigned in a new format, this guide is the most popular consumer resource book ever published for manufactured home buyers, providing at-a-glance listings with key information home shoppers need to make an informed buying decision. Plus, an annotated construction rating chart with 56 criteria you can use to evaluate any home before you buy. John Grissim’s bestselling The Grissim Buyer’s Guide to Manufactured Homes & Land has been hailed as the definitive resource for navigating the tricky waters of the manufactured home marketplace. This equally well-received companion guide takes a close look at every manufacturer and the brands they build, providing up-to-date, essential information together with authoritative, no-nonsense insights that have made him a respected industry observer and voice for the home-buying consumer. Click on Browse the books to learn more. 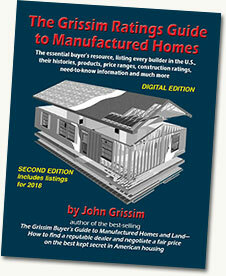 The second edition of the #1 bestselling consumer how-to guide to purchasing a manufactured home. This edition contains many revisions, up-dates and new material that make this invaluable resource even more useful to home shoppers. Retailers historically have been highly secretive about how much they actually pay for the homes they sell. Unscrupulous dealers regularly charge home buyers thousands more for their homes than they should. That’s outrageous. 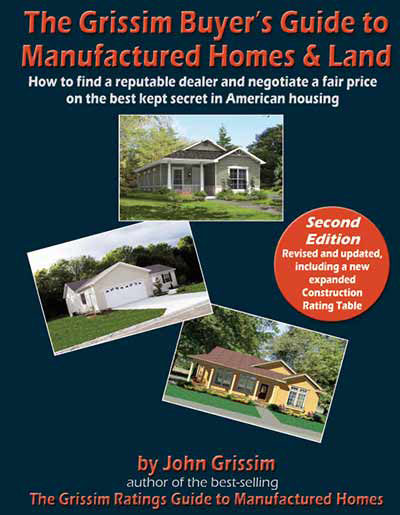 This authoritative guide explains just how the manufactured home industry operates, exposes its secrets and reveals insider information that even the good guys don’t want you to know. 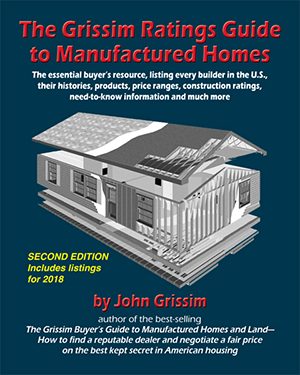 Among the many additions to this second edition are a greatly expanded discussion on selecting the right home, including a new glossary of common terms used in manufactured home construction, plus a new three-page Construction Features and Specifications Comparison Table with 56 criteria. This table enables you not only to identify what features are associated with different levels of quality but also to determine the construction quality (on a 1-to-10 scale) of any home you are evaluating (independent of what any sales person may claim). This same table is also in The Grissim Ratings Guide, and is by far the most comprehensive detailed listing of construction features and quality ever provided consumers. the installation (or set-up) process and the role of the set-up contractor, including a detailed installation check-list for home buyers. Warranty issues, and how to deal with them, receive added emphasis. Tips to better calculate the fair asking price for a home, together with a simple formula for determining your offering price during negotiations. In short, this guide contains all the information and tools you will need to confidently–and successfully–go through the home buying process.